Monday: AM: We learned our new letter of the week -u- which has very few objects, but an interesting animal, the umbrella bird. I confess I had to look this one up! We do not have any classmates with a name that starts with -u-, no surprise there. We then reviewed what we have learned about reptiles, and I introduced a new reptile group, dinosaurs. This is a very popular part of our whole zoology unit, who doesn’t love dinosaurs, right? I read a book to introduce the era and environment of these amazing creatures. We looked at the diversity in their scale and temperament as we understand it. I introduced the term extinct, which is, in my opinion, one reason all children love dinosaurs, they are big and scary but not alive anymore! We also discussed the terms herbivore and carnivore and looked at their teeth to determine the diet of a dinosaur. We talked about paleontologists, and the careful work they have done to reconstruct dinosaur fossils to better understand them. I then showed an opportunity for the children to practice the skills of paleontology, digging carefully through a box of sand to find some dinosaur “remains”. I put together some models of dinosaur skeletons to examine as well as a range of other works to explore types of dinosaurs. PM: I shared a group of dinosaur puzzles and demonstrated tracing the pieces one by one to then color as they choose. We discussed that we don’t really know the colors of the dinosaurs, so they can let their imaginations run wild! I then shared a way to better understand how huge dinosaurs were. We have 2 rolls of yarn which measure the estimated length of 2 dinosaurs, Brachiosaurus and T-Rex. It is quite impressive that the school is barely long enough to fit a T-Rex! Brachiosaurus wouldn’t even have fit length-wise into the school building! One last thing I showed is a book of photo pairs, one with raisin decorations shown and the other without. The children can ask for a bowl of real raisins to complete the 2nd photo and then eat the raisins, a snack as well as a work! Tuesday: AM: Isa brought in a bunch of fun dinosaur works, which her brother Ezra let her share with us. The children are so excited to learn as much as possible about their favorite reptiles! Thank you to Ezra and Isa! I then shared an opportunity to squeeze a cup of fresh orange juice, using a small juicer, a refreshing and healthy work, especially this time of year. Finally I showed a work to explore magnetism. Using a large magnet, the children can test a range of objects to sort them into 2 boxes labeled magnetic and non-magnetic. I also put out a group of works to experiment with magnets in other ways, creating sculptures and designs. Natalee then reviewed all the words for body parts in Spanish in a very fun way. Will volunteered to lay on a rug while children took turns to label his body in Spanish. He was so patient and still as his classmates placed the labels with the Spanish words! PM: I shared a couple more works to explore magnetism. The first is a set of magnet tubes and small metal balls which can be built into interesting, complex sculptures. The second is some magnetic discs, a rod base, and a set of cards showing patterns for the discs to be stacked. The challenge is to either match opposing or matching poles, to create either spaces between the discs or no spaces. It is so interesting that magnets with like polarity repel each other and instead bounce with space between! Wednesday: AM: In music we are continuing to explore rhythms with both sticks and a set of rhythm instruments. The children are also becoming comfortable with vocal echoing, and love forming a fun parade of musicians! At circle I showed a basic sewing work using small hoops and fabric with lacing holes and a large plastic needle and yarn. I then reviewed the Montessori bell work and showed the next extension, matching the 2 octave sets by tone. This is a complicated process which requires careful listening as they test the bells to hear a match. PM: I showed sewing a button. The children use a needle threader to thread a large safety needle and then sew a very large wooden button onto cloth held by an embroidery hoop. It is exciting for them to be able to do such a grown up task! I then offered a new way to write stories, using photos from magazines as an inspiration. Once a photo is chosen, they write the text, using moveable alphabet letters. The words are written with inventive spelling, which means as they hear the sounds, for example birds would be brds. I also demonstrated leaving space between the words using a finger space. 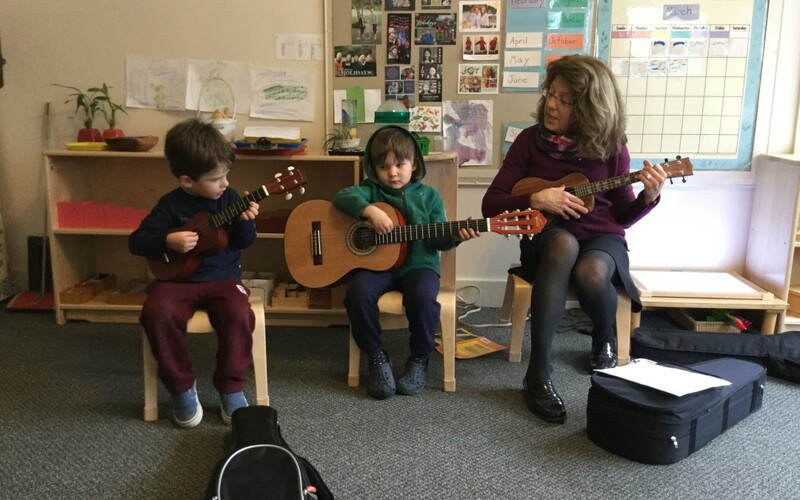 Thursday: AM: I had so much fun jamming with Joshua (on his Uke) and Theodore (on his guitar)! They had both brought their instruments for sharing and played along while we sang a fun song about a Stegosaurus. The other children were so impressed! I then shared a work highlighting how many animals, including reptiles, camouflage themselves for protection from predators. There is a set of large cards with a reptile hiding somewhere and a cut out of the animal to match to them in their hiding place. It takes careful examination. I then told a tale which bridges our time studying amphibians and now reptiles. It is about little boy snake and little boy frog, who meet by chance and have a fun time together learning how to hop and slide like each other. Once their parents find out, they are forbidden to play together, for snakes are the frog’s enemy and frog’s are the snakes food. The tale ends with them saying good-bye, but fondly remembering their friendship in spite of the differences. PM: I showed a math work, the addition strip board. This work supports them as they solve equations using 2 sets of number strips for 1-9. Using a large grid board, one lays the 5 strip alongside the 8 strip which ends below 13 in a row of numbers at the top of the board. The child uses a pre-written page of equations and once solved, records the sum.